DCO members Susan Lang (University of South Carolina, USA) Gretchen Früh-Green, Stefano Bernasconi, (both at ETH-Zurich, Switzerland), William Brazelton (University of Utah, USA), and Matthew Schrenk (Michigan State University, USA) investigated carbon cycling and microbial metabolism at the Lost City hydrothermal field. They applied genomic and isotopic techniques to previously collected hydrothermal vent samples to see how the community metabolizes formate, an organic acid formed from carbon from the mantle. DCO members Susan Lang (University of South Carolina, USA) Gretchen Früh-Green, Stefano Bernasconi, (both at ETH-Zurich, Switzerland), William Brazelton (University of Utah, USA), and Matthew Schrenk (Michigan State University, USA) investigated carbon cycling and microbial metabolism at the Lost City hydrothermal field. They applied genomic and isotopic techniques to previously collected hydrothermal vent samples to see how the community metabolizes formate, an organic acid formed from carbon from the mantle. The researchers discovered that methanogens could not use formate directly, but instead consumed carbon liberated by sulfate-reducing bacteria in the chimney. They report these findings in a new paper in Scientific Reports . Formate is one of the organic molecules found in vent fluids at the Lost City, and also a carbon source used by some methanogens. The group decided to take a closer look at formate’s source and who was consuming it. Several of the researchers on the paper were involved in some of the earliest explorations of the Lost City hydrothermal field and still had precious materials leftover from previous sampling trips. The researchers did not have complete sample sets from each of the eight sampling locations, however, so they integrated new and existing data sets from different locations. It was a “clean out the freezers” project that enabled them to apply techniques that have advanced considerably since they first collected samples more than a decade ago. One of the improved techniques the researchers employed is isotopic analysis. Isotopes are atoms of an element that carry a different number of neutrons. They can be traced through a food chain and used as an indicator of who is eating what. At Lost City, the formate in the vent fluids clearly formed from carbon from the mantle, because both are devoid of a carbon isotope called 14C. When the researchers looked for 14C in the lipids that make up the cell membranes of vent microbes, they saw that both bacteria and archaea lacked 14C, suggesting that they were living off of mantle-derived carbon. At some locations, however, there was some formate with input from seawater carbon, which has considerably more 14C than that from the mantle. Another way to find out what microbes are eating is to look for metabolic genes necessary for consuming different compounds. With support from the DCO Census of Deep Life, the researchers performed metagenomic sequencing on two chimney rock samples. They combed the DNA sequences for formate dehydrogenase, a key gene for formate metabolism. The chimney contained several copies of this gene from sulfate-reducing bacteria, but none from archaea, suggesting that methanogens could not use formate directly. Now that their freezers are clean, the group will return to Lost City in September 2018 to collect new samples. They plan to collect hydrothermal vent fluids to get a clearer idea of the chemical reactions occurring in the rock, and the diversity of microbes living in the subsurface. Using their improved techniques, they hope to address some of the many remaining questions about Lost City, such as why these methanogens have been so successful despite their formate handicap. 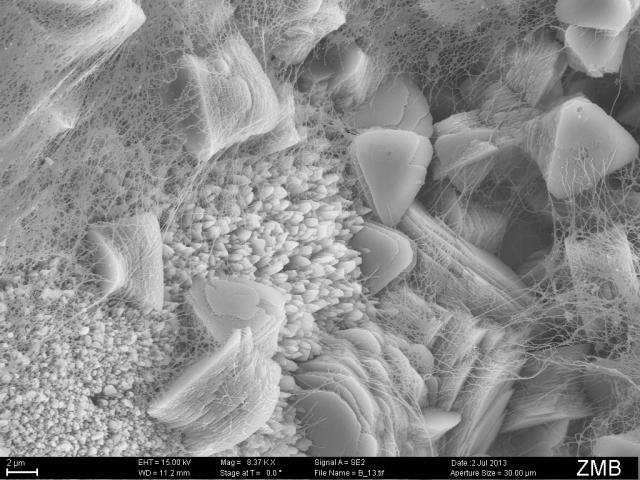 This scanning electron microscopy image shows a close-up look at the close association between crystals of brucite and the stringy microbial biofilms that cover them within a Lost City chimney. Credit: Image courtesy of Tomaso Bontognali, Susan Lang, and Gretchen Früh-Green.